Used both as an ornamental as well as a bush tucker plant the Mountain pepper berry trees will grow to 4 - 5m and prefer a cool climate. Two products are produced from the tree - the leaf and the berry. The berries when eaten fresh at first seem sweet and then the hot peppery taste kicks in, be aware this is a hot taste, so be careful. Pepperberries are more versatile than conventional peppercorn, able to be used in sweet and savoury dishes. 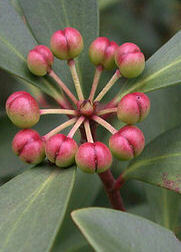 The leaves, stems and berries have an aromatic peppery taste producing approx. 3 times the anti-oxidants of blueberries. Native birds, such as the Black Currawong, eat the berries.